“Several years ago I realized that I really wanted, and it was time, to re-create the garden spaces around my house. I knew I needed help both to imagine what could be possible and actually make it happen. I invited Carol Lundeen to accompany me in the process, and am so glad that I did. She took the time up front to be with me in the yard and garden, to really get a sense of it and me, and to imagine what it was that I wanted. I remember being puzzled by some of her requests that I take a look from different and seemingly unusual vantage points and perspectives around the yard…. “What do you want to see when you sit and look out from HERE? she would ask.” She both sought to understand my preferences and quirky wishes as well as making suggestions and providing advice from her expertise. “I have known Carol for over three years. During this time Carol has worked with me in the garden, teaching me how to prune shrubs, set up compost bins, clear out invasive plants, test soils for the chemical pH balance, define edges, and so much more. “I had the pleasure of working with Carol and would recommend her highly. She is extremely knowledgeable and what I appreciated the most is her passion for sharing her expertise with others. As a client, she wants you to learn how to be able to do what she does. She is patient and encourages you to try out your newly acquired skills so that you feel start to feel comfortable doing them on your own. 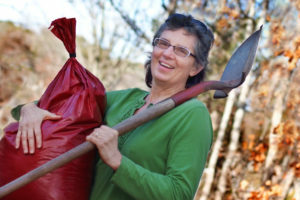 Some of the things I learned were how to: prune, fertilize , properly plant shrubs as well as create a home-made irrigation system as well as the proper way to hold gardening tools.